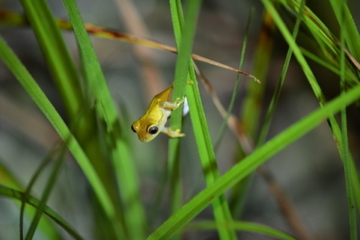 Detroit Zoological Society Curator of Amphibians Marcy Sieggreen is doing fieldwork in Peru, studying amphibians in the lower elevations of the Amazon River to see how they are faring with increased human populations and impacts in their habitats. Hola mi amigas y amigos! It has been nearly over a week since my last post and a lot has happened. We have seen several species of frogs at night. There has not been much activity during the day but it is still important to look and make note of what is or is not seen. We have travelled to all of the islands that we usually observe that are surrounded by the Napo but have also found another uninhabited island that is underwater during most of the year. What a pleasure it was to jump out off the boat and find hard sand (like what we know as a beach) with marine toads everywhere. Some of you may have heard that these toads are now found in several places in the world and are considered invasive species, making them a nuisance. Here in South America, they are native and an important part of the ecosystem. Since I had not seen many on this trip, I had a growing concern. 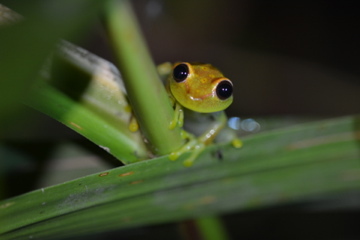 The island also had a bog that was home to several tree frogs. There were no species I had not seen before but a positive confirmation that species I would expect to see I had. I have seen many caimans, snakes and most recently a mammal, which I believed to be a Paca. Animals this size (about the size of a 30 lb dog) is not frequently seen and is very fast. Although amphibians are the most fun to track down, seeing other wildlife is always a treat. This upcoming week, I will be working with our Amphibian Protectors Club on an overnight observation through a small portion of the rainforest and along the canopy walkway. My colleagues from the Detroit Zoological Society’s education department are taking time out from their schedule to join us. We are hoping to be able to see lots of animals and document our findings back at the research station. Buenos noches!